Pure Metal Cards leads the industry in developing new and unique metal cards. Our pure metal identity cards enable your ID cards to really make their mark with the cardholder. Our pure metal identity card is available in any of our metals and card finishes creating a simply stunning identity card. Cardholder name, number, date etc. 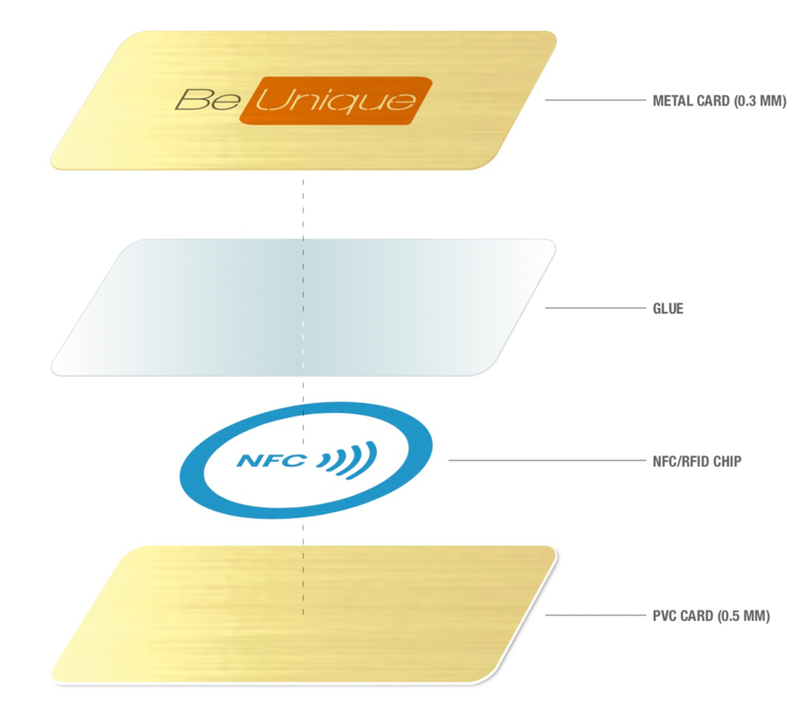 To add functionality to your ID card we can incorporate an NFC/RFID chip into the card body using a PVC card. 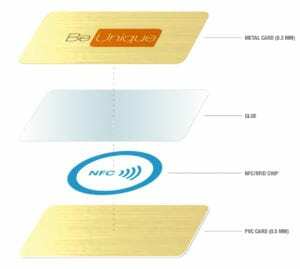 The NFC chip is programmable using an iPhone, Android device or dedicated card reader/writer. The chip itself is hidden within the PVC card. The chip can only be read from the PVC side, so the metal card acts as a shield. 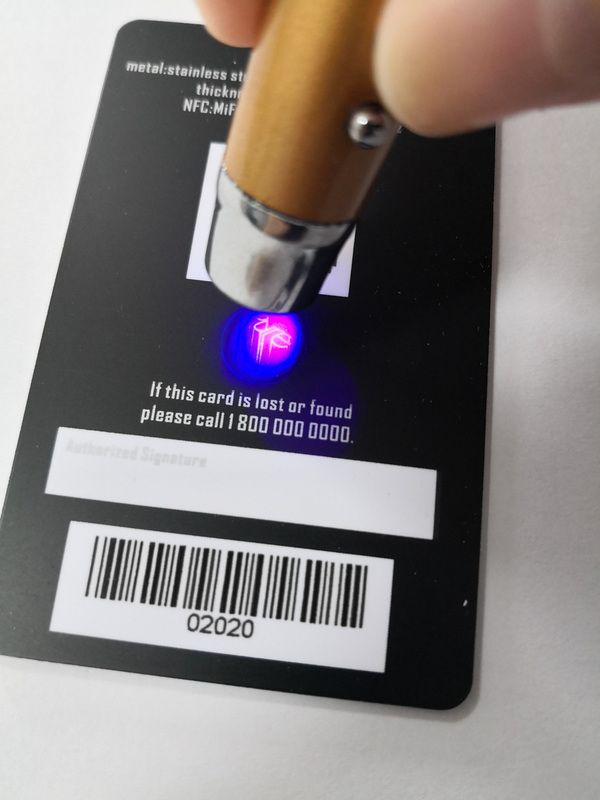 By adding an NFC chip to your pure identity cards you can set up digital trigger actions when the card is in near contact to other NFC enabled devices. You can program the card to access security features like a door or room access, link to your website or other promotional activities. Almost all modern smartphones are NFC enabled these days. We can also incorporate security features like a signature, hologram or smart chip to your ID cards. For government, police and security services please contact us for high-security identification cards. Pure Metal Cards provides premium quality PVC cards available in either a matte or gloss finish. These cards are in 0.5mm (0.02”) card thickness. These can be added to our metal cards in 0.3mm (0.012”) card thickness, which is available in stainless steel, brass, copper or titanium. 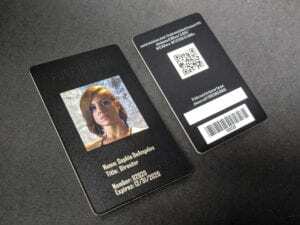 We can also personalize each identity card if required. We can also add a watermark using fluorescent dyes. These are dyes which fluoresce under ultraviolet light or other unusual lighting. These show up as words, patterns or pictures and may be visible or invisible under normal lighting. This feature is also incorporated into many banknotes and other documents. For truly unique metal identity cards, we believe there is nothing better than our dual finish combination of high-quality PVC and metal identity cards. 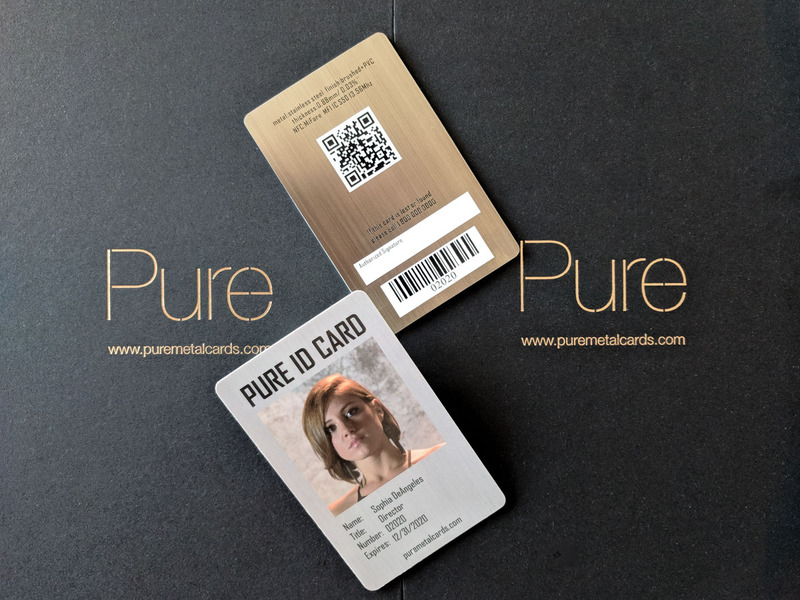 Why Choose Pure Metal Cards? Satisfaction Guaranteed – We want you to be completely amazed by your purchase. We replace cards if they do not meet your satisfaction. Speed – Pure Metal Cards offers the faster turnaround time in the market today for custom-made metal business cards. Cards typically take 7-9 business days to produce and 1-2 days to ship to you. Pricing – We lead the industry by offering simple, all-inclusive pricing. The price quoted on our website is the price you pay. The Range of Card Finishes – We offer the widest range of metals and card finishes available anywhere. For example, we have 12 different finishes for our matt black metal cards. With over 2 million metal cards shipped to date, we lead the industry in card innovation and options to make your name or brand stand out from the rest. Pure Metal Cards can help you develop your existing ID cards as well as business cards or membership cards to become an unforgettable metal card your recipients will enjoy receiving. A Pure Metal Cards identity card will ensure your cardholders will be unforgettable. For more information and pricing please contact us today.